There is no magic way to achieve sales success. However, there is one significant concept that helps the companies and sellers who embrace it—those who make it part of the fabric of who they are and who their sales organization is—experience wildly successful sales results. If you want to boost sales and join their ranks, you must become a Value-Driving Sales Organization. 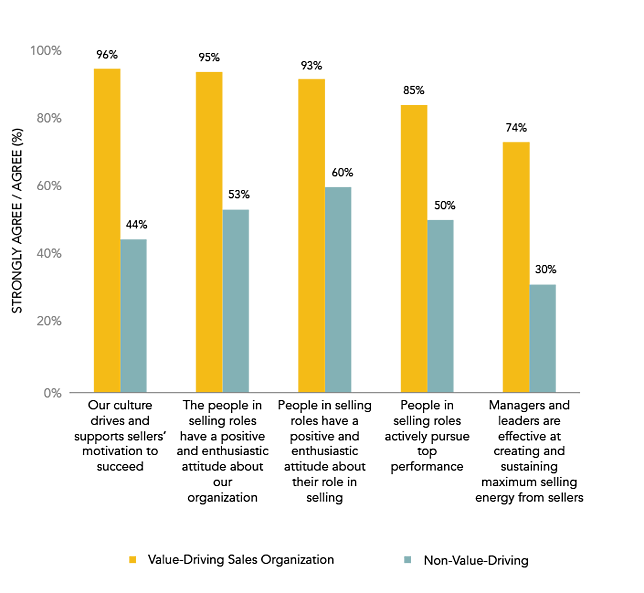 Value-Driving Sales Organizations have significantly higher win rates and revenue growth, and lower undesired turnover. They not only win more at higher margins, but also retain top sales talent. Click here to download our complimentary white paper, The Value-Driving Difference. Motivate: Make work meaningful to each member of your team and find ways to inspire them individually. Focus: Develop action plans with your sellers so they focus their time on the most important activities. Execute: Help sellers get in the zone and get the most done each and every day in our highly distractible world. Advise: Teach sellers how to consistently win their most important sales. Develop: Build the sales skills of your team to increase their effectiveness for years to come. Most sellers say, "When I believe in what I'm selling, I can sell so much more of it." When you have a Value-Driving Sales Organization, motivation is that much easier to inspire. Almost all the Value-Driving Sales Organizations have cultures that support motivation compared to less than half of the others. Furthermore, 85% of Value-Driving Sales Organizations have sellers who actively pursue top sales performance versus only 50% of Non-Value-Driving Sales Organizations. Focus on value and you can capitalize on a huge opportunity to drive seller motivation. Which do you think was most motivating? Results showed the #1 motivating factor is task clarity. If the seller is clear on what they need to do on a day-to-day basis, they are much more motivated. When sellers are left without task clarity, they have too many choices of what to do. As humans, we naturally take the path of least resistance and tend to do the easiest task in front of us. This is often not the most meaningful or impactful task that you should be doing. We've found one concept to be particularly powerful in helping sellers to know what to do: identifying their Greatest Impact Activity. Greatest Impact Activity (GIA): The one task—as hard as it may be—that a seller can do to achieve the greatest outcomes. You can help your team identify their GIAs by developing action plans for yourself and your sellers. With an action plan in place, sellers know exactly what they should be doing and where they should be focusing each day. Put the GIA first in the daily plan to give you and your team the best chance for success. Having a plan, knowing what you're supposed to do, and being motivated to do it is a great place to start. But if you aren't executing and getting the most out of every day, it's all for naught. In the last 15 years, the potential for distraction at work has skyrocketed. With email, internet, texting, WhatsApp, Slack, Instagram, Facebook, LinkedIn, etc., sellers are constantly being interrupted, making it nearly impossible to execute. 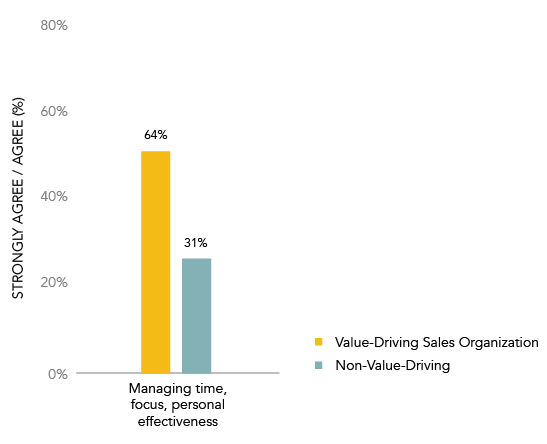 Value-Driving Sales Organizations are 2x more likely to have sellers who are better at managing their time, focus, and personal effectiveness. Imagine the improvement in productivity if your sellers were certain of the most important thing to do on any given day. Knowing their GIA and having an action plan allows them to be completely focused on doing it. Sellers are typically unorganized in how they approach winning sales opportunities. They approach each opportunity differently and often miss key elements during the sales process that can help them win. Consistent support and clear expectations from sales managers can alleviate this. When sales managers coach sellers on how to be most valuable to buyers, and help ensure all aspects of the sales process are thoroughly explored, the odds of winning go up. If the seller can't make the case to their sales manager for why a buyer should act and act now, choose you, and trust you, how are they supposed to make the case to a buyer? When you have a sales manager who regularly works with sellers and coaches them to win, your organization wins more frequently. 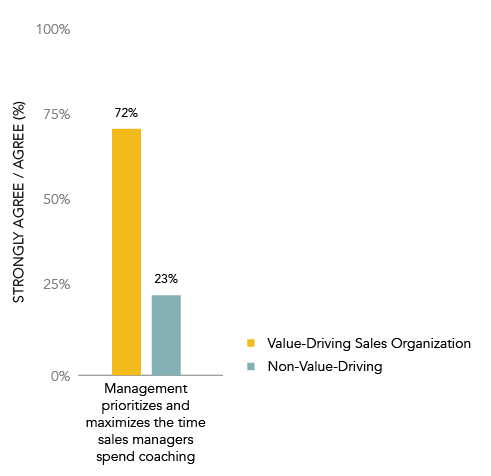 Value-Driving Sales Organizations have teams with significantly stronger sales skills across the board—from prospecting and consultative selling to strategic account management and sales management. The differences between the Value-Driving Sales Organizations and Non-Value-Driving Sales Organizations are stark. You must be able to drive and win sales opportunities. 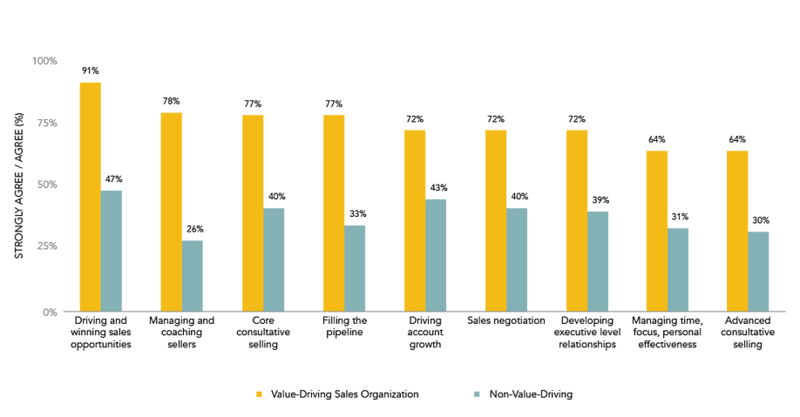 Indeed, 91% of Value-Driving Sales Organizations have sellers skilled in doing this compared to less than half of the Non-Value-Driving Sales Organizations. The second greatest skill is managing and coaching sellers. Note the difference: Value-Driving Sales Organizations are 3x more likely to have managers who are effective at helping sellers succeed. The third greatest skill is core consultative selling. This relates to the seller’s ability to understand, shape, and redefine need, craft compelling solutions to needs, and communicate maximum impact for the buyer. This can be summarized in one word: value. Sellers who possess core consultative selling skills are better at communicating and providing value. Develop sales skills with value at the center. The best sellers add value to the conversation above and beyond your products and services by sharing ideas and advice. The best sales organizations also have managers who can coach them to do this. So how do you boost sales? Become a Value-Driving Sales Organization. Do this and you'll generate more revenue with higher win rates at healthy margins, and you'll keep your best people. You'll also have an energetic, passionate, and enthusiastic culture of people working to satisfy your clients. What could be better?